FAQs » Frequently Asked Questions (English) » When my fiscal year starts in January, why is DonorWise posting into the next year with Dyanmics SL (Solomon)? Some organizations actually prefer this. They may have changed the beginning of their fiscal year to start in January. So after closing the previous year structure, they started new in January, but they started to use the next calendar year as their fiscal year, so as to not "recycle" their previous fiscal year. 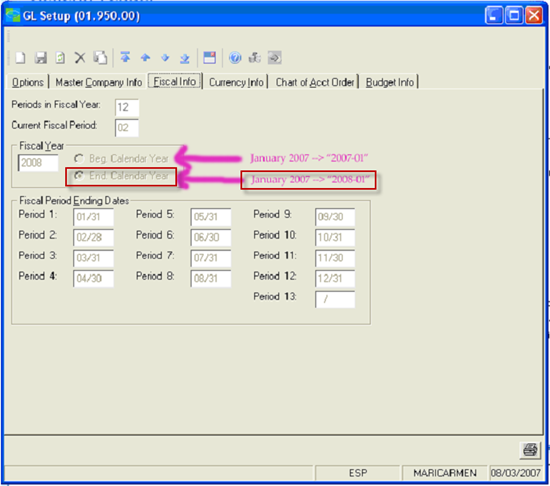 DonorWise supports this situation by examining the GL Setup in Dynamics SL. If your fiscal year starts in January, but you selected "End Calendar Year", it will assume you are using the next calendar year as your fiscal year. If your first period is in January, but you don’t want the fiscal year to be a whole year ahead, select “Beg Calendar Year”.